At the Chair for Computational Analysis for Technical Systems (CATS) at the RWTH Aachen University, Pointwise is used as the mesh generation tool for various computational fluid dynamics (CFD) applications, such as design and optimization of profile extrusion dies, simulation of blood pumps, fluid structure interaction for colloidal aggregates and aeroelastic simulation of horizontal axis wind turbines. 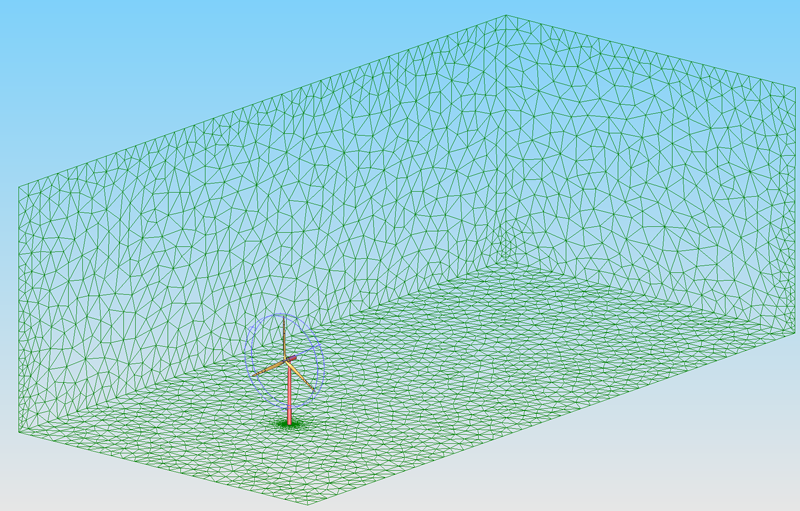 In this article, mesh generation with Pointwise for the wind turbine application is explained. The wind turbine project, funded by the German Federal Ministry for the Environment, Nature Conservation, Building and Nuclear Safety (BMU), aims to develop strategies to increase the life expectancy and reliability of large, horizontal axis wind turbines. This is achieved by solving the fluid structure interaction problem, which is formulated by coupling the rotor structure and surrounding fluid region to each other. In our simulation framework, a partitioned approach is applied, which means that the fluid and structural regions are solved separately by two single-field solvers, allowing the use of different mesh and various algorithms for each physical system. This approach requires the solution to be mapped between structural and fluid surface meshes at each time step via interpolation algorithms. For the wind turbine application, Timoshenko beam elements are used to represent the underlying rotor structure and a fully tetrahedral mesh is used for the fluid region. Additionally, in order to introduce active load control mechanisms, two flaps for each rotor blade are included in the model. Aeroelastic coupling and flap movement require mesh deformation whereas the rotor movement requires mesh rotation. Due to these special necessities, it is crucial to use a reliable mesh generation tool like Pointwise. Our in-house finite element flow solver XNS can handle rotating and stationary fluid regions, essential for a full wind turbine simulation. Modeling of both regions together is achieved by employing a thin "shear layer" between the two regions, which is shown as the clipped, gray region in Figure 1. The surface mesh for this region is created in Pointwise by rotating the U-shaped profiles (dark blue lines) around the origin. Then the obtained tri/quad mesh is triangulated to obtain final triangular surface mesh of the shear layer. Figure 1: The shear-slip layer, shown in gray, is the boundary between the stationary farfield mesh and the rotating mesh around the rotor of the wind turbine. 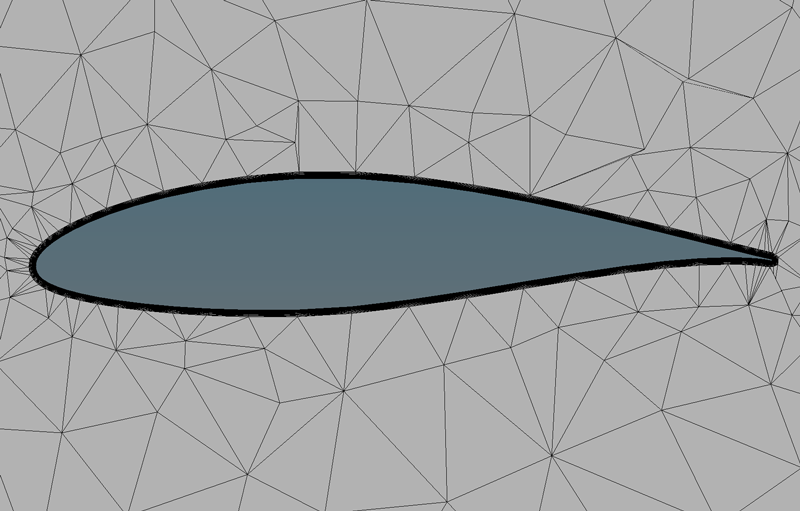 In order to generate the mesh for the rotor blade surfaces, shown as yellow surfaces in Figure 1, the underlying IGES geometric databases are imported into Pointwise. After defining the element size and node distributions along the connectors, structured quad-type mesh domains are generated for each surface. The resulting surface mesh can be seen in Figure 2. Figure 2: A structured surface mesh is used on the wind turbine rotor blade. Each color represents a different surface, either a flap surface or a bare rotor surface. This surface meshing approach, in which a structured mesh is created initially and triangulated later on, is preferred rather than directly triangulating the surface because it gives a finer control over the mesh density on each surface. This is especially important for aerodynamic applications, where the leading and trailing edges and sharp corners encounter substantial pressure and velocity gradients. Another important aspect of the wind turbine simulation is that the Reynolds number reaches significantly high values, especially toward the tip of the rotor blades. This requires a good boundary layer mesh in order to capture the pressure and velocity gradients on the rotor walls, which are the components responsible for the generation of torque and thrust as well as the turbulent characteristics of the flow. After the surface mesh generation is completed, a T-Rex (anisotropic tetrahedral extrusion) type boundary layer mesh is generated on rotor surfaces without difficulty. It is crucial to set the corresponding T-Rex boundary conditions and skew criteria in order to obtain a good quality boundary layer mesh. Some section views taken at the r = 50 m location along a blade can be seen in Figure 3. In this example, 16 layers starting from a size of 0.0007 m are used with a growth ratio of 1.1. It must be noted that the mesh density shown in the figures is not enough to fully capture the boundary layer as the transition from the inner to outer region is not smooth. Number of layers is restricted due to the limited computational resources, which leads to a large jump in cell size between the last layer and the isotropic grid as seen in Figure 3; however, it can easily be adjusted to obtain a better accuracy as shown in Figure 4. 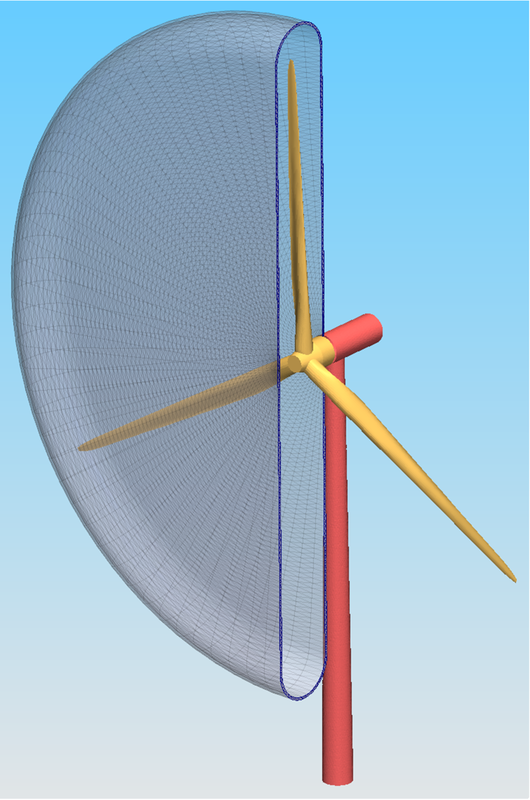 Figure 3: Cuts through the T-Rex mesh at 50 m radius on the rotor blade show how the layers were stopped before reaching isotropy in order to conserve computational resources used by the CFD solver. 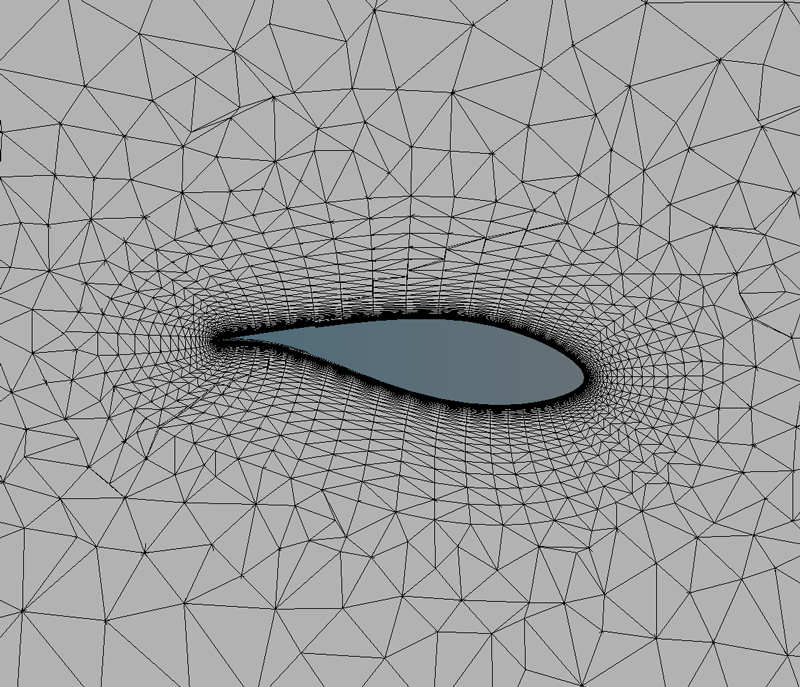 Figure 4: A fully resolved mesh with smooth transition from the boundary layer to flowfield looks like this. After the meshing of all blocks is completed, the physical boundary conditions are defined on the domains and the mesh is exported. The final configuration can be seen in Figure 5. 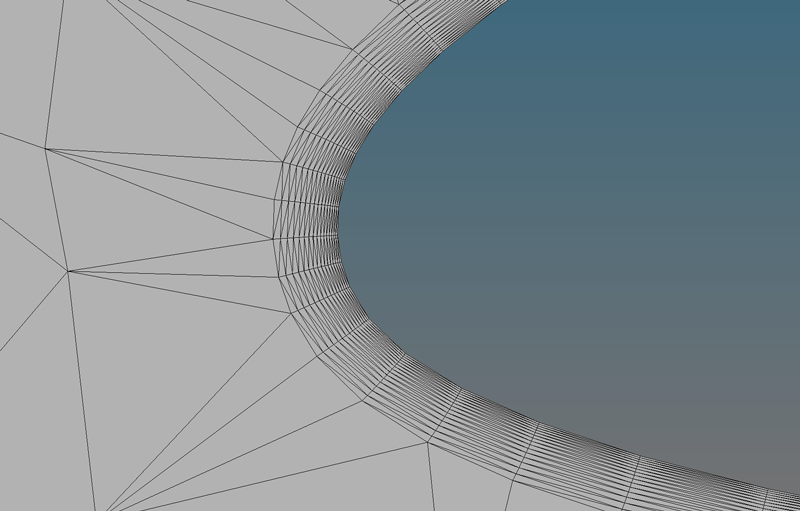 Front faces of the bounding box and the shear layer surfaces are removed for a better view of the components. Blue lines are left to represent the periphery of the rotating region. Figure 5: This wide view of the computational domain shows the size of the outer boundaries relative to the wind turbine. 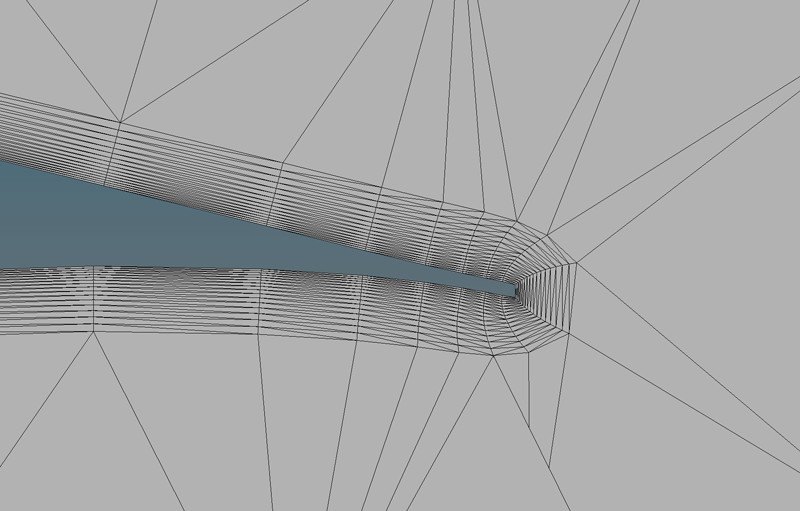 Having completed the meshing of the wind turbine, unsteady aeroelastic simulations are conducted successfully. Thrust and torque exerted on the rotor surface as well as the structural deformations are obtained at the end of the simulations. Currently, the focus is placed on the simulations with flaps and their effect on the wind turbine performance.